Click above to download the leaflet to promote the April 11 event. 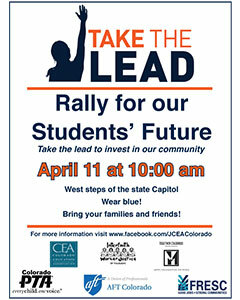 On Wednesday, April 11 at 10:00 AM, JeffCo teachers, students, parents and others will “Take the Lead: Rally for Our Students’ Future.” Jefferson County Colorado Education Association is co-sponsoring the event. Could be a good leafleting opportunity. April 11 is a furlough day for JeffCo teachers. This was written by Denver General Strike Committee. Posted on Saturday, April 7, 2012, at 8:11 PM. Filed under Events. Bookmark the permalink. Follow comments here with the RSS feed. Both comments and trackbacks are currently closed.